Showing results for tags '300TDi'. Wolf 300 Tdi : is it a myth ? I have been told that the army versions of the 300 Tdi are slightly stronger - as in more BHP - and have been build to a better quality than their civilian versions. Although I'm aware that they came usu. in 24 volt form, this claim is new to me. My questions are : 1 - is this extra power a myth ? 2 - 24 volt worth keeping ? 3 - Is there any way, apart from the rebuild plate, to trace the history of an engine ? Thanks. Hi all, I've managed to snap the barbed hose fitting off the banjo fitting on one of the injectors on my 200tdi. Numpty. I know that these banjos take a 6mm bolt and the barb fits a 3.2mm or 1/8 ID pipe. But I can't find such a thing for sale anywhere and want to avoid replacing the whole spill rail if possible. Can anyone help with a source for a replacement banjo union? Cheers! Cruise control not working. It's a very late model 300tdi ES auto. Seem to remember it worked when I bought the car about 10 years ago but never really bothered with it - would like to get it going, it's the latest thing on a long list I've been working through! So far I've replaced all the vacuum hoses - including the one to the brake pedal. Taken the pump out, direct wired to a 12v battery and system vacuums up ok - can see the bellows contracting, pump works ok etc. I've now replaced the pedal switch with a new one, still no joy. There didn't seem to be anything wrong with the old one (on a visual inspection) but it was the cheapest part to replace. I've checked all the brake lights, they work ok - I'm not sure if that would make a difference but checked anyway. ABS light comes on with ignition, goes off when moving etc all as it's supposed to. CC switch lights up when button pushed so power to there. It just doesn't do anything when I try to set it with the steering column switches. Noted that speed needs to be above 28mph so made sure I was going over that when testing. So, where do I go from here? I'm not an electrician but I tend to think it might be an electrical fault. Is there an easy way to check this (don't have a multimeter). Over the years the only things I've changed have been installing a tow bar (LR specialist fitted) and I did have the brake light switch replaced - not the CC one - when I realised I had no brake lights! (dealer fitted at same time as MOT). Not sure either of these would be a cause but I'm noting it to give the full story. Any ideas gratefully received! Have been looking through loads of posts on various forums about this, most seem to suggest hoses or brake light switch - but that doesn't really help me i'm afraid. I have a 1995 300 TDI Defender 110. I am trying to find the rear axle number but it is not in the location that is shown in the Workshop Manual. I've seen some comments online about others not finding it either. The front axle is clearly marked 63L07376A. Does anyone know if Land Rover didn't stamp the rear axle for that year? Hey guys, my defender has broken down and do not know where to start troubleshooting. It was driving normally until I turned it off for 15 mins and when I turned it back on it had a bad knocking sound coming from the engine bay, I thought I might make it home, started driving and the noise got louder and eventually engine cut out about 5kms down the road, had to get a tow truck back home. It still cranks over, It is a 1996 300tdi with 260000kms on it. Any help would be much appreciated, thanks. 1) Hi, my horn has stoped working. Horn works when supplied with 12v (purple/black) and 12v arrives at Fuse 10 fom the switch (purple/black). Supply lost somewhere between the horn switch/fuse 10 and the horn itself. I can't find the horn on the RAVE wiring diagram for this car but surprisingly the switch is shown on the Engine Immobilisation schematic. It feeds Fuse 10 then the alarm relay (R200). The horn is not shown. Any clues as to how the supply gets to the horn would be appreciated. 2. I have checked the alarm relay and it is fine but not as shown on the schematic. The schematic shows 87A connected to 87 internally, I do not believe this to be correct. I understood that if the relay has 87A it should be a changeover, normally made contact with 30 as the common. My relay doesn't have 87A but has 87B which is a double pole single throw relay with 30 as the common. I have had the vehicle for 14 years and never changed a relay and the horn worked until recently. Can anyone throw any light on this? 3) I checked the alarm function and it flashes the indicators but makes no sound. I do not have a sounder shown as D110 on the schematic but have a battery backed unit shown as D154. I assume this to be faulty. I did (long after having no horn, so unconnected) let the vehicle's battery go flat a few days ago and wondered how long it takes to charge the sounder battery. I not that the manual says it charges from the generator so presumably needs the ignition on to do so. I guess, if that is the case, it is to stop the vehicke battery being discharged by charging the sounder battery. Any info appreciated. I bought standard folding side steps for my 300tdi 90. Passenger side no problem but diesel tank is in the way on the driver's side. Can't get access to side rail to bolt it on and no exposed chassis to put the strut onto. Is there a different step for this? On our way back from Lightning Ridge to have a look at my neighbors opal mine the alarm went off 22 K's north of Gilgandra - no turbo pressure, no oil pressure. I turned the engine off and coated onto the grass verge on the side of the road. From there we arranged for a tow into Gilgandra, not the best town in the west - they dont even have a taxi service ! I initially thought that maybe the turbo bearing(s) had blown but that wasn't the case, I disconnected the oil feed line to the oil cooler, pulled off the fuel solenoid power supply to stop the motor from running and turned the motor over for a good 45 seconds - no oil ! the level in the sump was on the mark so it wasn't due to lack of engine oil in the sump and I've been since advised that the inner "gear" on the oil pump have been known to crack in two resulting in zero oil flow --- has anyone heard of this before ? I'm secretly hoping its just the oil pick-up pipe that's come adrift but I wont know until Saturday after I drive there with a trailer to pick the Disco up. Hi all Having a problem with a lack of vacuum assistance on my 300tdi 90 (conversion, running td5 axles with vented front disks for what it's worth) . Having to absolutely stand on the brakes to slow down, it's not great. So far I've replaced the brake servo with a brand new one (not blue box, replaced o ring to master cylinder as well), tested that there is vacuum, tested the one way valve. Nothing has worked! Pumping the pedal until hard when the engine is off, then maintaining pressure as I start the engine and the brake pedal doesn't change at all. When I checked the vacuum I wasn't sure how strong it's meant to be, I found it much more noticeable with the engine a couple of hundred rpm above idle. Incidentally I also noticed when I changed the brake pads a couple of weeks ago that it took a herculean effort to push the pistons back in, which isn't a problem I've had before. The caliper pistons don't look that bad to me either. Not sure if that could be connected? Hello all, Been an avid reader on here for a few years and always found it to be a great source of guidance and inspiration so thank you all very much. I own a '97 90 300tdi that I am in the process of a complete rebuild onto a galvanised Richards Chassis. Attempted to fit the bulkhead to it yesterday.... only to find the bulkhead doesn't fit :-( The holes in the chassis are 12mm further apart than the holes at the bottom of the bulkhead A pillars. The bulkhead is the original item although I have welded in new footwells and had it galvanised. Whilst never expecting a perfect fit, 12mm does seem to be a bit much to force the A pillars apart to make it fit. Wondering if anyone has come across a similiar problem and can offer any guidance as to whats best to do? Chassis measures 1505 mm hole center hole to center. Bulkhead measures 1493 hole to hole center. 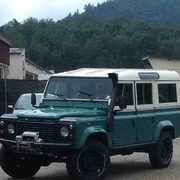 I have a Defender 110 300TDI with a Puma dash conversion. I need to get the rev-counter, temperature gauge and fuel gauge to work. The speedometer works btw. I understand that the rev counter can be made to work by getting a signal from the W terminal in the alternator, but I am unsure if that will work with a Puma gauge cluster, I don't wanna risk ruining the gauges. So how can I get these gauges to work? My '95 land rover discovery auto diesel with the 300tdi engine was sitting for afew months and when i got it going again its got this weird issue with the engine. when you push down the accelerator the revs will go up like normal but will soon drop down to just below 1500rpm and stay there, no matter how far you push the peddle in it wont go any higher it is possible to get it working steady but only if the peddle is pumped up over 3000rpm Heres a video showing it: https://www.youtube.com/watch?v=zdaEkRXyZWM I have fresh fuel, cleaned the sedimenter, new fuel filter, new lift pump, checked injectors were working correctly, usual exhaust emissions. would love to get out driving again as its my kayak wagon, any help greatly appreciated. 300 TDI Engines - new stock? Disco tyre diameters, Mix/Match - essential ? Okay, as some of you may be aware I'm going to be driving down the Canning Stock route from Halls Creek to Wiluna in Western Australia riding shotgun for a mate who intends cycling the 1800 odd kilometers, of sand dunes, corrugations and salt lakes in a planned 10 days or less. He intends cycling at least 10 hours a day so lil' old me will be pottering along some 2 k's behind him at around 19 kph. I am not allowed to give assistance merely to carry his spares and tools. He has to carry his own food, water bedding tent etc. WA has received an extraordinary and unseasonable amount of rain this year and the spinifex has grown. Now, for those of you who haven't encountered spinifex imagine a nasty vindictive vegetable porcupine rooted deep into the soil. It may be a form of tussock grass but trust me it can and in my case the sharp stalks have punctured my tyres both in the side walls and right through the tread. The problem is that the stalks are so thin that external detection of the leak with soapy water is almost impossible, the only solution is fully immersing the wheel in a tank of water - and tanks of water are rare in the desert. The solution is to remove the case and fit a new one, I carry a pneumatic bead breaker and tyre levers and although I'd rather get someone else to do it, - because its bloody hard exhausting work - I can and have replaced several tyre cases. So, okay I will be taking around 10 wheel/tyres with me, Mounted on my six rims will be 6 Bridgestone Desert Duellers - these are 235/70R16. I also have 4 Maxxis 225/75R16. My question to the forum is this; the rolling diameter of the Bridgestones is a theoretical 29" (if they were brand new with 100% tread, which they are not, they all have around 7mm of tread depth to the limit bar) the Maxxis are a theoretical 29 1/4" - again if they were brand new with full tread, again they are not, they also have around 7mm of tread to the limit bar. So, can I use the Bridgestones and the Maxxis together on the same axle with reasonable impunity with only 1/4" (6mm) diameter difference bearing in mind that if I get a puncture in the desert they will be running around 16 psi - do I have to use the same tyre brand/size on the same axle or can I mix-match as and if I get a puncture ? After my 300 TDI wouldn't stay timed I opened up the case and stared at it for a long time. After a while I realized the crankshaft timing gear wasn't quite aligned with the outer woodruff key cutout. After pretty much destroying my gear puller and 8 M5 bolts I was able to get it off. Make sure you use a hammer and chisel to knock it back in line before going after it with a puller. I replaced it with what I think is a higher quality gear and put the crank pulley bolt on good and tight. Now she is right as rain. 300tdi engine trouble, big blue smoke!! !